He is a great doctor. I was made comfortable the moment I met him even if I was a new patient with him. The staff were very helpful and friendly. I would recommend Dr. Jon Siems to everyone who needs cataract removal. Fantastic doctor, Fantastic results. Would recommend Dr. Siems services to all. Thank you. Dr. Saini is my angel! I am so thankful to be a patient of his. The genuine care, kindness, and generosity he has shown for me is more than I could ever repay for. Andrea and Amy are so wonderful! I love them all! I really enjoyed my experience with your office. Thanks for being great at what you do! I'm very happy with the whole cataract removal procedure and follow ups. My son-in-law had lasik surgery with Dr. Siems 20 years ago and still happy. Best ever in all areas. I share with everyone. Dr. Doan and I share common interest/goal regarding life which is a first for me. He's like spending time with a friend. BEST EXPERIENCE EVER AT DOCTOR'S OFFICE! I was very comfortable during the tests. The rooms are relaxing and clean. I would recommend Dr. Bhojraj because she's warm, concerned, and accurate. 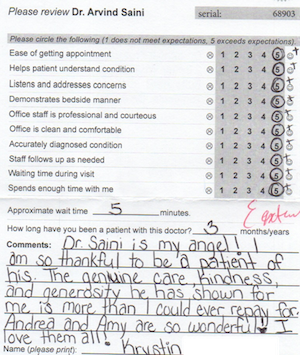 Dr. Arvind Saini is a true, honest, caring, professional! I am a patient with complex issues and this fine doctor took the time necessary to diagnose my condition and prevented unnecessary surgery! Dr. Doan is smart, accurate & most important - caring. I would highly recommend him. Friendly doctor and staff informative. 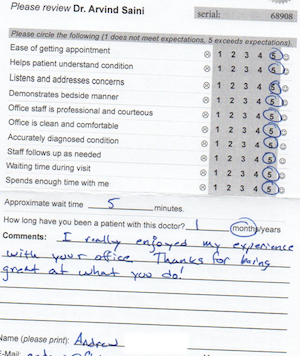 I was very pleased with the overall handling of my appointment and the service I received. Staff is very courteous and helpful. Took really good care of my grandma. I mean it. For the first time. I am 67 and from the old school. Personality is the most important and next communication is a must. Outstanding eye practice with highly knowledgeable caring physicians! We love Dr. Doan! Dr. Doan was an absolute blessing and pleasure! Very genial & pleasant personality. Took time to listen & fully explained his findings. Great experience. Very knowledgeable & courteous. Answered all of my questions. It was very educational to learn how advanced my astigmatism is. Plus the office staff was above average. Quick and easy. He found the sand in my eye quick and with no pain. He did an excellent job. Dr. Doan and his staff are terrific they are so helpful and kind. What a wonderful experience. our appointment was. God bless Dr. Doan and his staff. I was very impressed with Dr. Doan and he took his time with me. I didn't feel rushed and didn't get the feeling that I was just another number. I would recommend Dr. Doan to everyone. P.S. I enjoyed sharing his Christian views. Great job! Love Saturday appointment! Extremely satisfied, explaining condition in detail and now I understand better. Wait time = 5 minutes. First visit today. Wait time = 10 minutes. First time. Services & personal contact excel in every aspect. Definitely a top-notch in their chosen field. I am seeing better than ever! Courteous, professional staff. Doctor was very informative and helpful.